A few weeks ago I did a blog post on how to install the dlib library on Ubuntu and macOS. The Raspberry Pi 3 ships with only 1GB of RAM. This 1GB of RAM is responsible for all system operations, displaying the GUI/desktop, and handling our compile. In fact, if you tried to compile dlib on the Raspberry Pi, your compile likely bombed out with an error. In order to get dlib with Python bindings to successfully install on your Raspberry Pi, you need to update your system to reclaim as much memory as possible as well as update your swap file size. Luckily, this isn’t as challenging as it sounds, and if you follow the steps detailed in this guide, you’ll have dlib installed on your Raspbian system in the next 45 minutes. To learn how to install dlib on your Raspberry Pi, just keep reading. 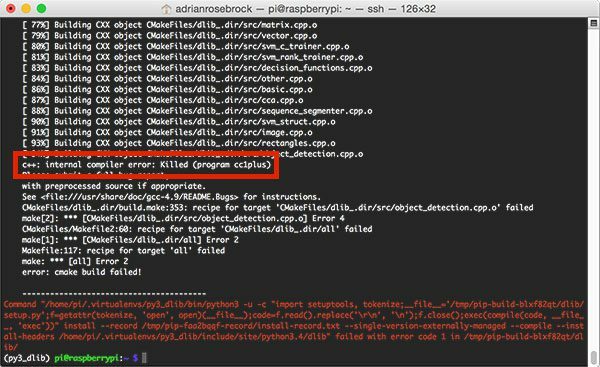 The first part of this tutorial discusses the common memory error you’ll encounter when trying to compile dlib with Python bindings on your Raspberry Pi. We then move into my six step guide to installing dlib on the Raspberry Pi. 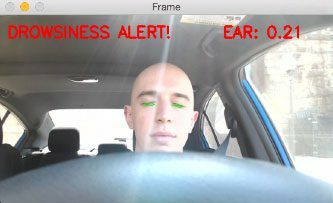 Finally, we’ll wrap up with an example demonstrating how to detect facial landmarks using dlib, Python, and the Raspberry Pi. Running into memory errors? System crashing? Figure 1: The dlib compile failing on the Raspberry Pi due to the C++ compiler being killed. This error message boils down to the dlib compile program using too much memory and the Raspbian operating system killing the process, preventing the Raspberry Pi from seizing. However, the preventative measures weren’t enough — 3 out of the 5 times I tried to compile dlib on my Raspberry Pi without updating my swap file size, boot options, and memory split (detailed below), my Pi simply locked up and I had to hard reset it. In order to get dlib with Python bindings installed on Raspbian, we need to reclaim as much available memory as possible. We’ll dive into how to do this in the next section. Increase your swap file size. Note: For nearly all screenshots in this tutorial, I was SSH’d into my Raspberry Pi from my host macOS system (that is why the screenshots are from the macOS terminal rather than the Raspbian terminal). Swap files, or swap space, is space on a hard disk/memory card used as virtual memory as an extension to a system’s real memory (RAM). Enabling swap files allows your operating system to “pretend” like it has more on-board memory than it actually does. Using the swap file architecture, pages in RAM are “swapped out” to disk until they are needed again in which case they are “swapped in”. Nearly all major operating systems support swapping to some degree. In Raspbian, the dphys-swapfile solution is used with a default of 100MB dedicated to swap on our card. Figure 2: Updating the Raspbian swap size to be 1024MB rather than 100MB. 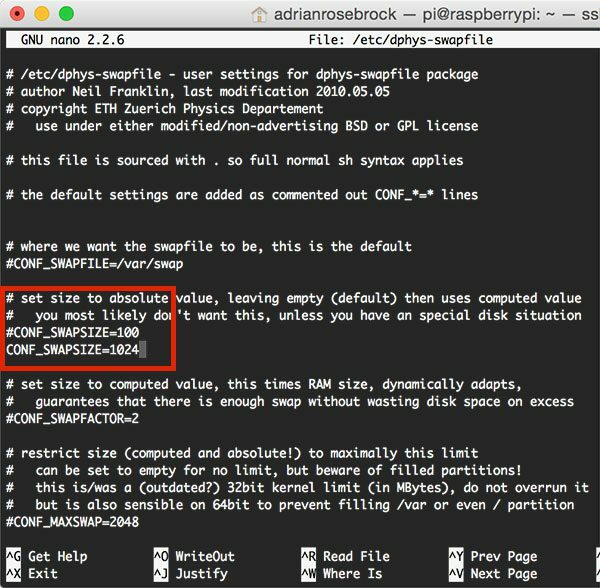 Notice here how CONF_SWAPSIZE=1024 — this will be more than enough swap for us to compile dlib on our Raspberry Pi. Note: Increasing swap size is a great way to burn out your Raspberry Pi card. Flash-based storage have limited number of writes you can perform until the card is essentially unable to hold the 1’s and 0’s anymore. We’ll only be enabling large swap for a short period of time, so it’s not a big deal. Regardless, be sure to backup your .img file after installing dlib just in case your card dies unexpectedly early. You can read more about large swap sizes corrupting memory cards on this page. The start command will likely take a few minutes to finish executing since the swap size is being increased and re-allocated. To confirm that your swap size has been increased. Figure 3: Running free -m confirms that the new swap size of 1024MB is being used. By default, your Raspberry Pi will boot into the the PIXEL desktop (assuming you’re using the latest version of Raspbian). This is fine; except that the PIXEL desktop requires memory — RAM that we desperately need for the dlib compile. Instead of booting into the PIXEL GUI, we should instead boot directly to the terminal. This will save us a substantial amount of memory. 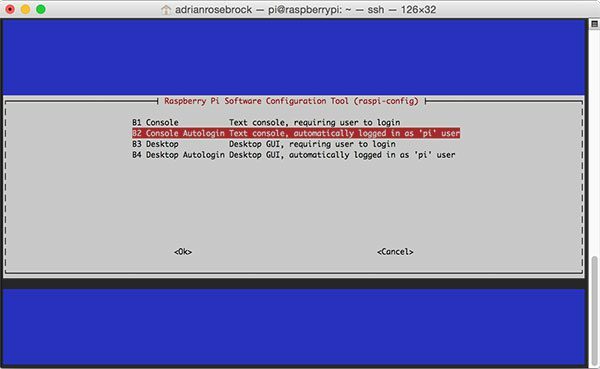 Figure 4: How to set your Raspberry Pi to boot to a terminal rather than a desktop. This will ensure that your Raspberry Pi boots directly to a terminal, skipping the PIXEL desktop. However, before you exit raspi-config , be sure to update your memory split, as detailed below. 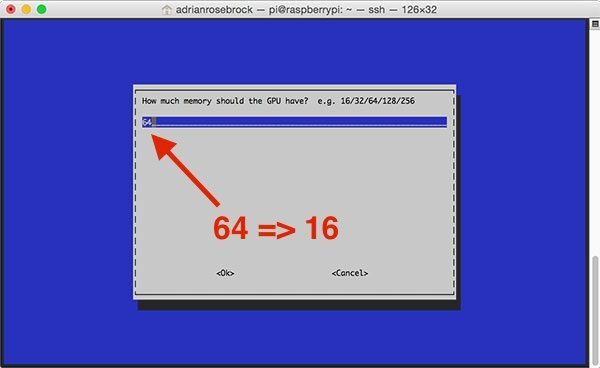 By default, the Raspberry Pi allocates 64MB of memory to the onboard GPU. We should reduce this number to 16MB to reclaim memory for the compile. Figure 5: Update your GPU/RAM split to be 16MB rather than 64MB. Update this value to be 16MB and then exit. Upon exiting, raspi-config will ask if you would like to reboot your system. Go ahead and reboot, then we can move on with the rest of the install tutorial. Once you’ve verified that pip is installed, we can move on. All of my OpenCV install tutorials on the PyImageSearch blog make use of Python virtual environments. Using Python’s virtualenv and virtualenvwrapper libraries, we can create separate Python environments for each project we are working on — this is considered a best practice when developing software in the Python programming language. I’ve discussed Python virtual environments many times before on the PyImageSearch blog, so I’ll spare any discussion of them here. If you would like to read more about Python virtual environments please refer to any of my installing OpenCV tutorials along with this excellent Python virtual environment primer. Otherwise, I suggesting creating an entirely separate virtual environment using themkvirtualenv command. Please keep in mind that this step is optional, but highly recommended. For readers who have followed any of my previous OpenCV install tutorials on PyImageSearch, please make sure you access your Python virtual environment before proceeding to Step #4. Figure 6: Successfully compiling dlib with Python bindings on your Raspberry Pi. If you would like to access your OpenCV bindings along with your dlib bindings from the same virtual environment, make sure your cv2.so bindings are properly sym-linked into the site-packages directory of your Python virtual environment. Important — before you walk away from your machine, be sure to reset your swap file size to 100MB (using the process detailed in the “Step #1: Increase swap file size” section above). You can then reset your GPU/RAM split to 64MB as well as update the boot options to boot into the desktop interface versus the command line. After making these changes, reboot your Raspberry Pi to ensure they take affect. For a detailed review of the code above used for facial landmark prediction, please refer to my previous post on the basics of facial landmarks. Make sure you’ve installed/upgraded the imutils library via pip install --upgradeimutils . Use the “Downloads” section below to download the code + example image + pre-trained dlib facial landmark predictor). 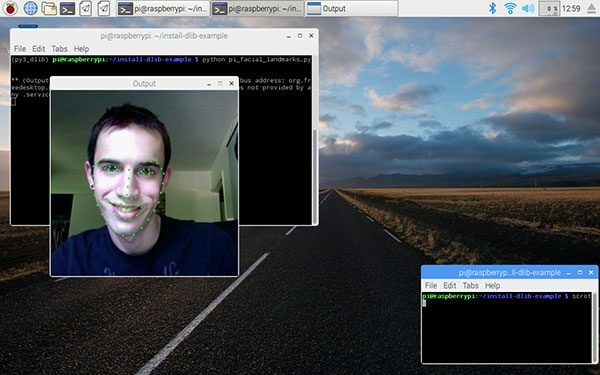 Figure 7: Detecting facial landmarks on an image using dlib on the Raspberry Pi. Fun Fact: The picture above is of me during my undergraduate college days — I actually had hair back then! Unfortunately, from my tests, the Raspberry Pi 3 is not fast enough to perform facial landmark detection in real-time. In my experiments there was a significant lag between polling the next frame from the video stream, followed by applying facial landmark prediction, even when using a threaded video stream for optimal performance. The reason for this is because the face detection process is extremely slow. Keep in mind that the Raspberry Pi 3 processor runs at only 1.2Ghz while the processor on my Mac (and likely your machine) runs at 3.1GHz (or similar). This is a huge increase in speed. Methods to speeding up dlib’s facial landmark predictor can be found here — I will be reviewing them in a future blog post with accompanying Python implementations to help us obtain real-time facial landmark prediction performance on the Raspberry Pi. In today’s blog post we learned how to compile and install dlib with Python bindings on the Raspberry Pi. Increasing the amount of swap available to our system. Booting our Raspberry Pi to the terminal rather than the desktop. Reducing memory allocated to the GPU and giving it to main memory instead. By performing these three steps we were able to reclaim enough memory to install dlib on our Raspberry Pi. However, now we’ve run into the issue that the Pi isn’t quite fast enough for real-time facial landmark prediction. We’ll address how to speedup facial landmark prediction in a future tutorial.